1. Set oven to 375 degrees F.
2. Rinse the shrimp under cold water and pat dry with paper towels. 3. In a shallow dish combine the cornstarch with salt and red pepper; stir to combine. 4. Place the egg whites in a med. bowl; beat using an electric mixer on high until frothy (about 2 min). 5. Place the coconut in a shallow dish. 6. 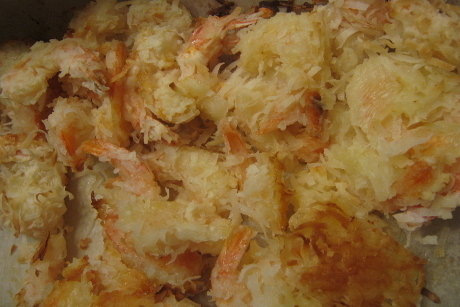 Working one shrimp at a time dredge the shrimp firstly in the cornstarch mixture, then dip in egg whites and then in shredded coconut. 7. Place the shrimp on a foil-lined baking sheet that has been generously coated with cooking spray. 8. Repeat with remaining shrimp (cornstarch, then egg white and then in coconut). 9. Lightly spray the shrimp with cooking spray. 10. Bake for about 20 minutes or until the shrimp are done, turn the shrimp after 10 minutes of cooking making that 10 minutes per side.